The Art and Craft of TV Directing offers a broad and in-depth view of the craft of TV Directing in the form of detailed interviews with dozens of the industry’s most accomplished episodic television directors. 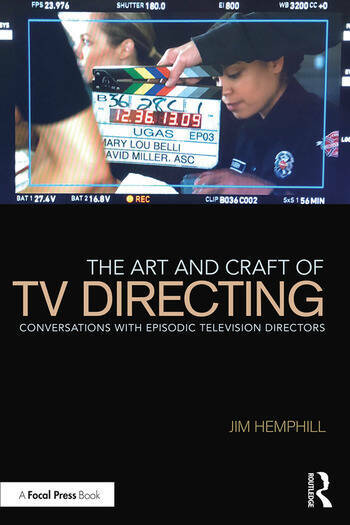 Author Jim Hemphill provides students with essential information on the complexities of working in episodic TV, highlighting the artistic, technical, and interpersonal skills required, and exploring a variety of entry points and approaches to provide a comprehensive overview of how to begin and sustain a career as a television director. The book discusses how to merge one’s personal style with the established visual language of any given show, while also adhering to tight budgets and schedules and navigating the complicated politics of working with showrunners, networks, and producers. The book also features interviews with a range of directors, from feature directors who have moved into episodic TV (Kimberly Peirce, Mark Pellington) to directors who have made the transition from other disciplines like acting (Andrew McCarthy, Lea Thompson), hair and makeup (Stacey K. Black) and stunts (David M. Barrett). This book provides unprecedented access to the experiences and advice of contemporary working episodic television directors, and is an ideal resource for students studying television directing, early career professionals looking for advice, and working directors looking to make the transition from feature directing to episodic TV directing. Jim Hemphill is an award-winning screenwriter and director whose films have screened at the Sundance Film Festival, American Cinematheque, and other prestigious international art houses and festivals. He has written about movies and television for numerous publications including American Cinematographer, Film Comment, Filmmaker Magazine and Film Quarterly. He is a programming consultant at the Egyptian and Aero theatres in Los Angeles and works as a visual historian at the Academy of Motion Picture Arts and Sciences. "A terrific read! Jim mixes his encyclopaedic knowledge of film and TV with his true passion for the craft. The result is a series of illuminating interviews as valuable to the professional as they will be to the novice."